Extra sharp scissors able to cut very thin, soft braided lines. Specially treated stainless steel blades have fluorocarbon polymer surface for sharper edge. Its small body is quite easy to carry to field. Size 110mm, 5" Made in Japan. Jun's comments: Snowpeak is based in Niigata Japan, and its outdoor products are highly praised for quality. 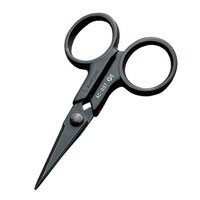 I've been searching for sharp scissors able to cut very thin soft braided lines, and this is it.